What girl wouldn’t want to have Harry Winston sparkling around her neck or wear a beautiful designer gown and shoes? I sure would, but I can only dream about it – the life I lead doesn’t include a walk down the red carpet at the Oscars or even an invitation to dine at the White House. I do however get invited to the neighbor’s party and have the occasional wedding, shower or fundraiser to attend. I have friends who are having babies and my daughters always had birthday parties to attend on a weekly basis. Family, friends and my co-worker’s pass milestones that are worthy of recognition. It took me a while, but I came to realize that these day-to-day events that fill my calendar are my walk down the red carpet. I could choose to let them pass by without giving them much thought, or I could elevate them into a way to enable me to express my personal style and in doing so, not only make my life more rewarding, but put a smile on the faces of the people around me, too. At Oscar time I think of all my friends who would love to wear the gown and jewels and I like to make them something stylish so they feel special and red carpet worthy. 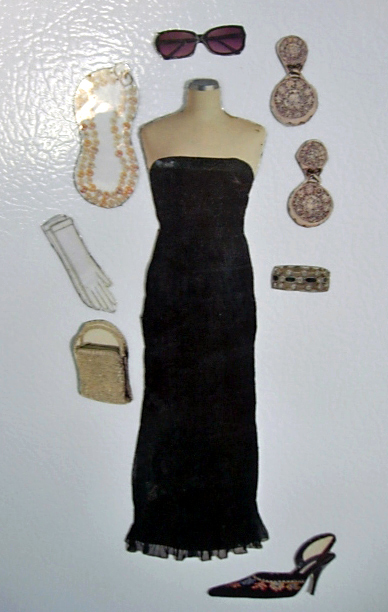 Since my friends and I don’t have the lifestyle to ever need one of the glittering gowns or gems, one way I can make them feel special and Oscar worthy in my book is to make them a collection of stylish refrigerator magnets that their fridge can wear for them. 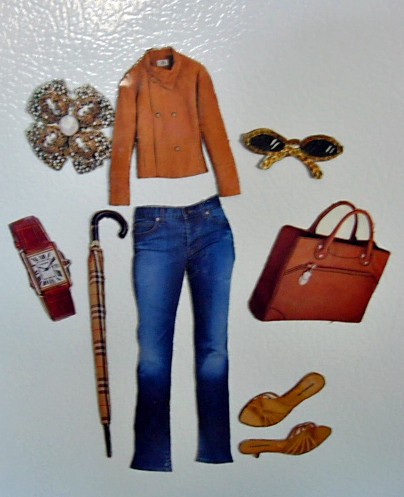 It is a little like playing with paper dolls, just think of the refrigerator door as the doll. When I am reading fashion magazines, and see a great looking dress, piece of jewelry, or an object I know my friends or family member will adore, I cut them out and place them in a folder. 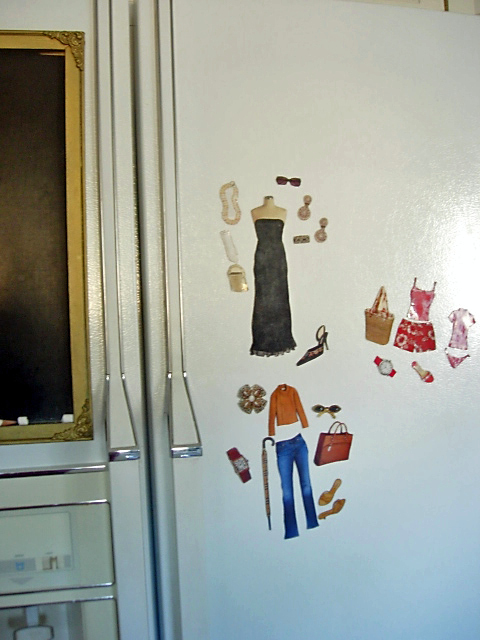 Before the Oscars or a big event in their lives I give them a paper purse filled with a to-die for dress, handbag, shoes, and jewelry that they can accessorize their refrigerator doors with. 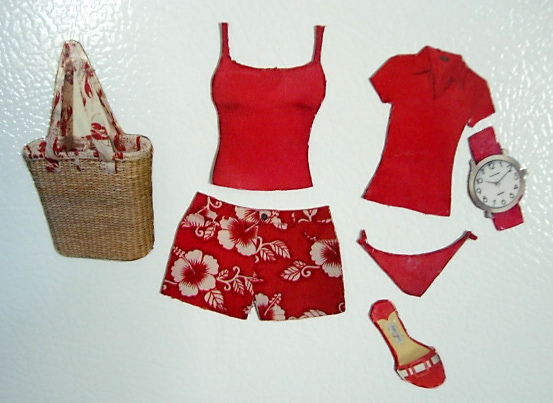 When arranged on the refrigerator, they will be able to mix and match to create outfits, like the Chic Simple books do and feel a little red carpet magic going on right in their kitchen. Try to be creative and think of opportunities to give-away a free wardrobe, maybe a friend is going on a fabulous trip. You can put together a collection and title it “Trip to Paris”. Include a suitcase, sunglasses, scarf and anything else you can find that relates to her trip. Every time she goes to her refrigerator she will be pleasantly reminded of her upcoming trip and think of you. Browsing through magazines searching for items to include can be inspiring – you will find that there are images of just about anything you can think of. How about a photo of a bouquet of flowers for your garden loving friend, highly polished kitchen appliances from Williams Sonoma for a foodie friend, and images from baby catalogs filled with all sorts of baby paraphernalia for your cousin who is expecting her first child. It is an inexpensive, yet creative way not only to surprise someone, but to let your personal style shine as well. You can turn any image into a magnet. I save all the sheet magnets I get from the local pizza place to the ones my dentist gives me to promote her practice. You can also buy sheets at craft stores in many different sizes with adhesive already on the sheet. You can find the adhesive sheet magnets at Amazon along with magnet sheets that are designed to go in Ink Jet printers. Which allow you to print images directly from your computer. Place sticky side of self-laminating sheet on top of clippings and smooth to make sure there are no air bubbles. Spray the adhesive on the top of the magnet and arrange clippings on top. Smooth each image with your hand to make sure images adhere. Trim images with scissors, closely following the details. Run a matching colored marker around the edge to create a more finished look to each image. Embellish an evening gown image with glitter or teeny tiny beads. As I am typing this post, I am watching the Oscars. I just head a line from a very funny movie that I think is fitting for this post. Find ways to celebrate your everyday! What an awesome, awesome idea!!!!! Opens up a whole new world for all my saved and unused magnets–now, if I can only find them!! I am a quilter, and can just see these for all kinds of quilt inspirations and sewing items! How fun is this!!!! YOU are awesome, Diane!!! So glad I found you!!!!! This is such a cute idea! I want to try it with clothing like you did. Hope to see you at Philly! How fun is that! What a cute idea! Oh how cute!! My kids would love that. Especially my daughter. Cool! I couldn’t stay up for the Oscars the whole way, but I loved the gowns. If I ever get a granddaughter, these will definitely be on my list of projects to share with her. There you go again, knocking my socks off. My girls would think they had died and gone to heaven if they had a fridge full of these to play with. I am thinking the would make excellent Easter gifts, thanks for inspiring me. My daughter is going to love, love this project! fun!